This website aims to record people and places connected with and of interest to the family and friends of the Lannon, Glavine Melville, Fraser, Booth, Gunn, Linekar and Hegg families and families connected to those genealogical research lines. It seems appropriate to start this site showing the many connections to the Melvilles of Golspie, Sutherland, Scotland, the Lannons of Fortune Harbour, Newfoundland, Canada and a Gunn Family of Caithness with a picture of the wedding that was the start of the story. 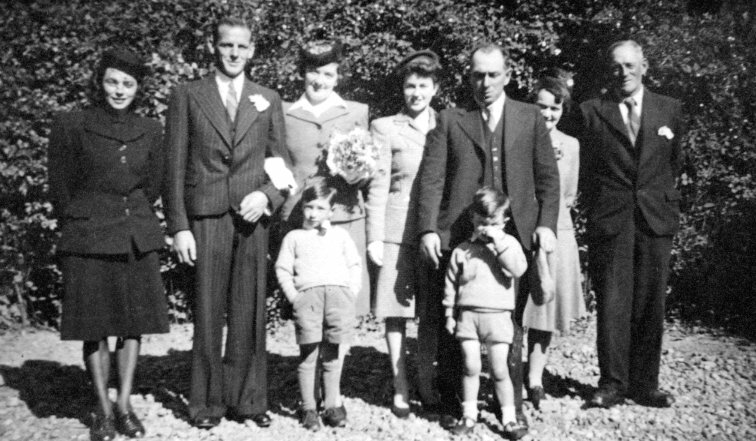 It shows the parents, of web-author Allan Cathel Lannon, and guests at the marriage of his parents Annie Isabella Melville and Matthew Joseph Lannon in Dingwall in 1945. Left to right back: Joey Melville (nee Angus), Matthew Lannon, Annie Melville, Barbara Melville, George Melville (Wordie), Mary Melville (nee Sutherland) and George Melville (Candy). Left to right front: David Melville and Donald Melville. The Family History report on this site is the result of many years of work and still progresses as new links are searched for and found. The information by its very nature and volume will be added to over a long period of time but this very process may encourage interested parties to log on regularly to see what has been added. The families described on this site are mostly connected, though not in all instances closely, to the author's family. However, a number of interesting families with tenuous links or supposed links but yet to be proven are also include due to their special interest to the author.